Get your cameras ready!!! 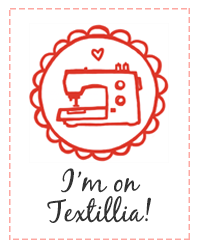 Eventually, I'll make a better button or two, but this will do for now. The background is hard to make out, especially at such a small size, but it's the ABC part of the "ABC Sweater" that I never finished... should do that soon for Addison. Influenced by recently viewed cinematic selections, and because it amuses me -- and maybe you -- I deliberately chose the typefaces: the A is Arial Black, the B is Brush Script, and the C is Clarendon; the "ABC-Along 2008" is, of course, Helvetica. Because it's everywhere and must be here. I run a very loose whatever-along ship, so the "rules" are simple: It's a year-long group where participants post a photo to their blog and/or the ABC-Along 2008 Flickr Group every two weeks to correspond with a letter of the alphabet. Photos should reflect the personality of the photographer; the subject should be of importance or meaning to them; photos can be related to fiber, but it is not required. Post at least one photo in each 2-week period to match the corresponding letter of the alphabet. There are 52 weeks in a year and 26 letters of the alphabet, allowing two weeks per letter (Weeks 1&2=A, Weeks 2&3=B). Example: - "A" is for... Alaska, asparagus, alpaca, astronomy... Whatever you choose, it should have some meaning for you. The first “two week” period is actually almost three, which allows a little extra time for sign up. Invitation requests will be accepted on Flickr through January 19th. The Flickr group is public (can be seen by all), but membership is by invitation only. You can make me (Vicki Knitorious) one of your Flickr contacts and request an invitation, or send me an email (vknitorious @ gmail . com). Okay, asking for good thoughts for Maddy this afternoon as SHE'S INTERVIEWING FOR A NEW JOB. This would be Plum, in so many ways, drawing on skills and nurturing creativity. It would be a little bit before she'd start. (In the meantime, I think I've found a cleaning lady.) Thanking you in advance. Katie will be heading back to Madison tomorrow, her nice vacation comes to an end when she reports on Friday for her first shift since Christmas Eve. It's really been fun having her here. Good thoughts for her, too, while I'm at it; all the good vibes needed to STICK IT OUT FOR ONE MORE YEAR. She gets all wishy-washy and, I swear, if she wasn't locked into a lease until August, she'd probably be moving home right now. She knows that the best thing is to finish what she's doing -- and she can do it. ONE MORE YEAR. And, you know what, as long as I'm at it, let's think some good thoughts for Ali, too. She's been so quiet and even seems a little preoccupied the past several days. I keep asking her Is something wrong? Is everything okay? and she says No and Yes (respectively) but she's SO QUIET -- AND SHE KEEPS THINGS TO HERSELF (huh, wonder where she gets that trait) and, well, basically, I DON'T BELIEVE HER. But I'll have to wait 'til she's ready to share. Good thoughts for all your girls - and you of course. Oblique looks great! You're speeding along! I finished both fronts but have yet to cast on for the arms. I want this sweater done NOW. good thought are coming your way for all the girls! ps. sweater is looking great! Thanks for the ABC schedule. You know how I like a good schedule. Good thoughts for all your girls. I have worry enough with just one, I can't imagine having 3! Thanks for "hosting" the ABC-along! I've already taken TWO 'A' pictures and have one more in mind, so I'm glad to see the phrase 'at least one' in the guidelines! And there happen to be 3 Fridays in the first two week period, so perhaps some Eye Candy Fridays are in order. Good thoughts for all the girls (thinking hard to float them up by you). I too have been knitting from the skein some lately -- and my friends keep asking me why. 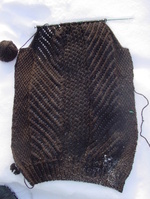 Mostly because I'm too lazy to wind it, or too impatient to get to the knitting part, I guess! And it's not good if for some reason you find yourself using the restroom a lot. But it works better than I would have thought, and easy enough to twist it up again when done. Many good thoughts for all three girls and a special one for the one who cares SO much for them!! Looking forward to ABCing! I am really looking forward to participating in the ABC-along! And your Oblique is looking fabulous! I am sending positing thoughts your way for you and your girls! ABC!We are going through the same thing here, in terms of the offspring. It's hard for them, Vicki. We just have to love them through it. 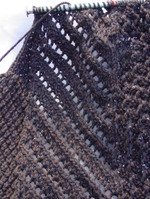 I love that Oblique, it looks like fun knitting. My thoughts go out to you and the girls. I have one like Ali. Never know what is going on in her head, only that something always is. Makes it hard. Good luck. 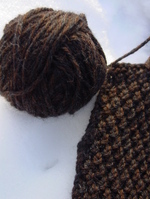 I should practice that skein method for those times when I don't have access to my winding tools and NEED TO KNIT. We had issues from the other end of the spectrum come up during our holiday trip - parental changes and plans. Here's hoping we can find solutions that make parents and siblings lives what they want them to be and that your girls get what they want out of what they get. And I just realize that this morning I signed up for a pair of Cat Bordhi workshops that fall smack in the middle of B Period. During the last few days I'll be checking out some Bead Shows at the Tucson Gem and Mineral Shows. Now, what to do for A? Good thoughts to you and your girls. I to have been knitting from the skein, I don't know why, but when I saw the pics on the harlot's blog of that lady knitting with the skein draped over her shoulder a little light bulb came on.... and I thought, why not? Good luck to you & all your girls in 2008! And thanks for the Brigaderios recipe. It's so simple and yummy. Good karma to maddy, Katie and Ali-coming in threes huh? I'd love to join ABCalong! Please? Oblique seems to be the new Clapotis and yours is gorgeous! Hi Vicki! I'd like to participate in the ABC-along, too............can you send me a Flickr invitation? Thanks!